Liz Bernatzek tells stories – either via her Instagram account or through her website – and feels most at home in lively metropolises. The freelance photographer and producer knows how to create an atmosphere with her images and easily dives into the varied scenes of a city. unu and Liz have shared a close connection for over years. Liz uses her unu Scooter Classic to discover new places in her home city, Berlin. Always with her camera in tow, to document these spots and share them with her followers. We met Liz for an interview to find out how the unu Scooter enables her and which places in Berlin she especially likes. Liz, what do you do? I’m a Creative Producer at R/GA, a freelance photographer and Instagrammer. Have you always wanted to do this or how did you come to your profession? I’ve always been creative and initially worked in event and project management. Three years ago, I started with digital marketing, with a focus on social media. What do you get up to on a ‘typical’ day? A typical day doesn’t really exist for me. I live in Neukölln and work in Prenzlauer Berg. My unu Scooter Classic is the perfect companion for my commute. Depending on the project, my day and location are always different. I often have to travel to London for my job. After work and on the weekend, I like to spend time taking photos, meeting friends or cooking. unu and Liz have shared a close connection for over years. 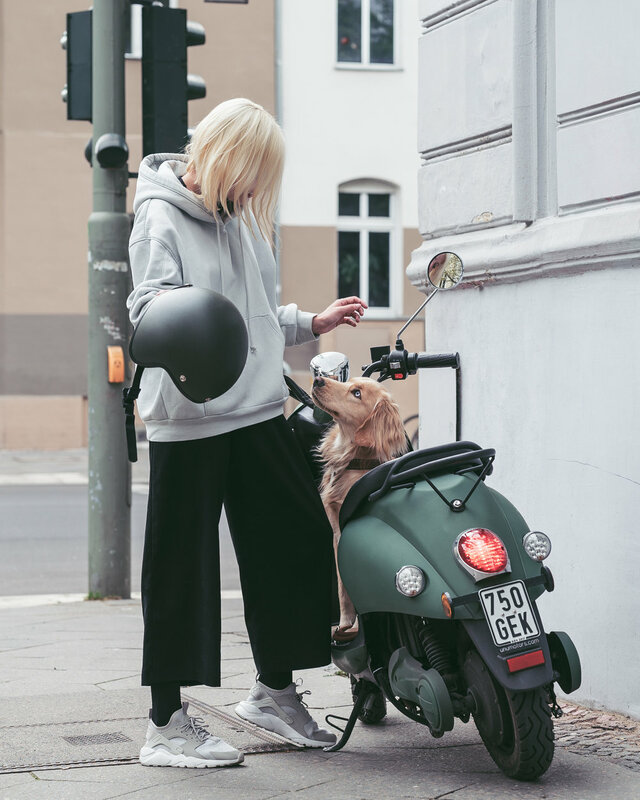 Liz uses her unu Scooter Classic to discover new places in her home city, Berlin. unu cares about sustainability – what are your thoughts on this topic? Sustainability is a really important topic for me. I’m trying to adjust my whole lifestyle, as well as my way of working. Yet another reason why I identify so deeply with unu and why my scooter has been such an important part of my life for the past two years. How has your own unu Scooter Classic changed your day? There is no better feeling than riding through Berlin in the evening hours with a soft breeze blowing and forgetting about the world around me. unu wants to enable people to be flexible. What does flexibility mean to you? I’m a very organised person. However, flexibility and openness are essential both in my personal and work life. I want to create my day as dynamically as possible and avoid to limit my creativity. This means that I can fully concentrate on the things that are important to me. What do you value about Berlin and why would you call it your home? Berlin is the only European city that I can imagine living in at the moment. I moved here from Chicago in February 2012 – without a job, home or friends. I need the big city feeling, the anonymity and a creative environment to be happy. Every time I leave the city and return, I have a smile on my face because I’m returning home. Are there any places you visit more frequently now with your unu Scooter Classic? unu makes it possible to get everywhere more easily. In the summer, two of you to Schlachtensee, with my tripod and camera bag on my back to a photoshoot or from my home in Neukölln to work in Prenzlauer Berg. Do you have some inside tips for places you especially like in Berlin? And my current favorite artist is Peter Aurisch, based in Lichtenberg. Thanks for the interview, Liz!